If you have picked up a six-pack of wax begonias at the supermarket to add to a flowering container on the front porch, you have barely begun to scratch the surface of the Begoniaceae family. Once you get a sampling of the more than 10,000 varieties under cultivation, your hunger to learn more about these easy-to-grow plants with succulent foliage might have you sending off for a subscription to the "Begonian," the bi-monthly journal of the American Begonia Society. Here are just a few to whet your appetite. Most variegated plants have white markings on green leaves, but the Charm variety of begonia has vivid yellow splotches on bright green leaves, giving it a psychedelic effect. 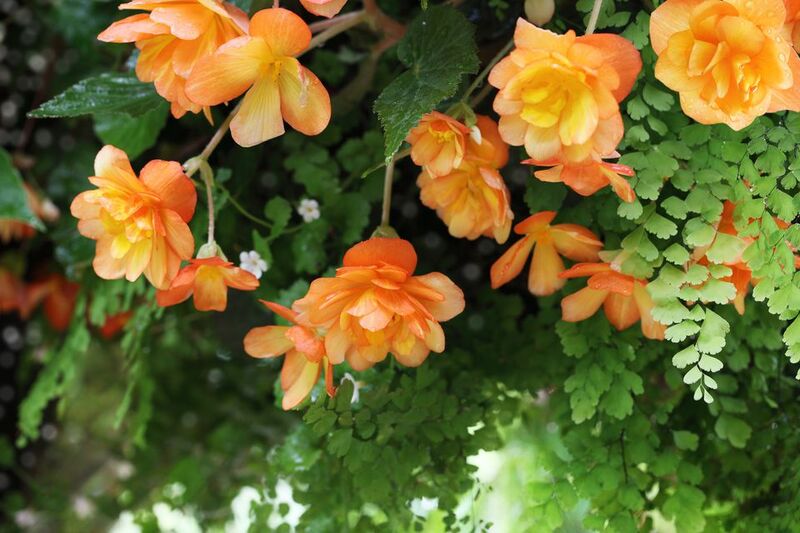 Make this begonia the focal point of your flowering containers. This type of begonia grows to a height between 6 and 12 inches with a width spanning between 18 and 24 inches. Variegated begonias need partial exposure to the sun to maintain the color development on their foliage. You can save the tubers of Solenia Rose at the end of the growing season for blossoms next year. Dig them in the fall, dry them for 10 days, and store them in a cool, dark place until the following spring. It grows to a height between 10 and 12 inches and the width can span from 18 to 24 inches. Like most begonias, this variety requires partial sun. The bronzy-green foliage of the sun begonia Richmondensis seems to color-shift in different light conditions. The underside of the leaves has a reddish tone, which gives them special appeal in hanging baskets. This variety needs some light shade to grow properly. It is a rather large plant with a height that reaches between 18 and 24 inches with a width between 12 and 24 inches. The Non-stop series is the preferred tuberous begonia for regions with hot summers. Tuberous begonias like moderation in all things, including light, water, and fertilizer. You will want to put this plant in a partial sun area. It grows to a height of 10 to 12 inches with a width between 18 and 24 inches. If you remove the spent blossoms of the Nonstop Rose begonia and allow the plant to put its energy into more blossoms instead of seed production, you can achieve the mass of flowers shown in this container. Keep the plants in an area sheltered from the wind to prevent bud drop. 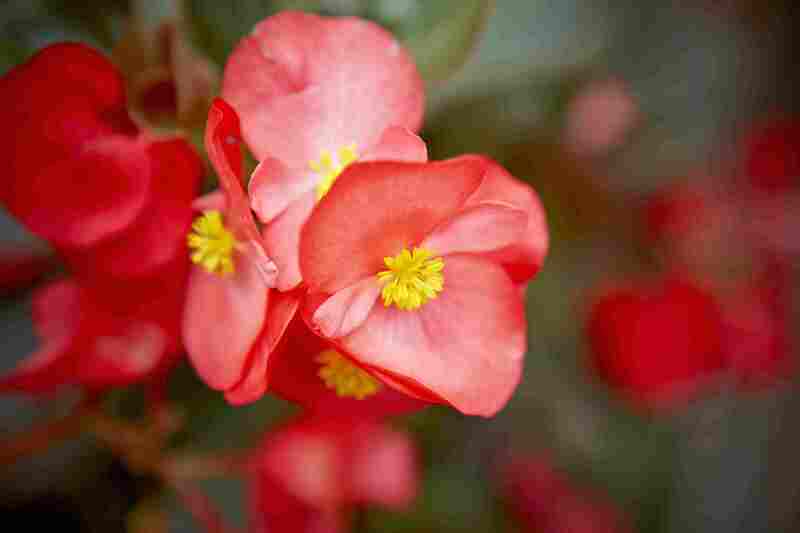 It grows to the average begonia size of 10 to 12 inches tall and 18 to 24 inches in width. This plant requires partial sun. The thick, fleshy leaves of wax begonias make them a good choice for beginning gardeners, as the plants are drought and pest resistant. The compact plants of Ambassador series grow large flowers in shades of red, white, and pink. This plant requires partial sunlight. This is one of the smaller begonia varieties growing between 6 and 12 inches high and only spanning 8 inches across. Dark-leafed begonias can take the sun’s heat better than green-leafed varieties. It can be planted in partial or full sun locations. This tidy bedding plant will not overstep its boundaries, so tucking it between green-leafed garden plants will highlight its bronze foliage and fill in landscape gaps. It grows to a height between 6 and 8 inches and spans 8 to 12 inches wide. The fully double white blossoms of the Doublet begonia series are barely the size of your thumbnail but will outshine the rest of the plant's foliage throughout the growing season. This wax begonia variety does not produce seeds and therefore needs no pinching or deadheading. This type requires partial shade and will grow to a height of 12 inches. It will grow between 8 and 12 inches wide. Angel wing begonias are classified as cane-like begonias because of their long stems that look like bamboo canes. Grow the Torch Pink begonia in bright light to prevent it from becoming lanky. This large plant will grow to 12 inches in height and 24 inches across. It needs bright filtered light to grow properly. Level up your windowsill with Rex begonias, the best houseplant for foliage lovers. Leaves deliver a trifecta of beauty, with outstanding colors, foliage, and textures that thrive in ordinary windowsill conditions. Varieties like Tornado and Silver Queen sport metallic leaves accented with green, purple, or splashes of red. Pink Charming and Duarten suggest a stained glass effect that comes from rich veining and stippling. The moody Red Kiss could stand in for roses as a romantic gift, and its lusty colors are much more enduring than any cut flower arrangement. The small stature of Rex begonias make them ideal as terrarium plants and keeping them this way reduces watering chores.